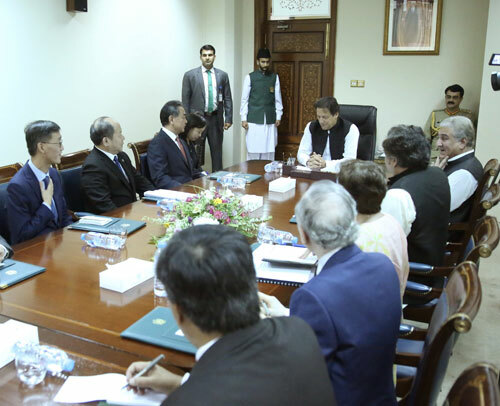 On September 9, 2018 local time, Prime Minister Imran Khan of Pakistan met in Islamabad with State Councilor and Foreign Minister Wang Yi. Imran Khan asked Wang Yi to convey his sincere greetings to the Chinese leaders. He expressed that Pakistan and China are all-weather strategic cooperative partners. Bilateral relations have not only been established on the common will of the governments of the two countries, but also on the profound and friendly relations between the two peoples. China holds a special place in the hearts of the Pakistani people. The new government of Pakistan has been committed to promoting the further development of Pakistan-China relations. The Pakistani side is willing to fully cooperate with the Chinese side to well construct the Pakistan-China Economic Corridor (CPEC) which is the landmark project of economic cooperation between the two countries and an important part of the joint construction of the Belt and Road Initiative. It is amazing and admiring that China has scored such great development achievements. I particularly hope to learn the achievements and experience from the Chinese side in poverty alleviation and anti-corruption. I am looking forward to my attendance at the first China International Import Expo and official visit to China this November. 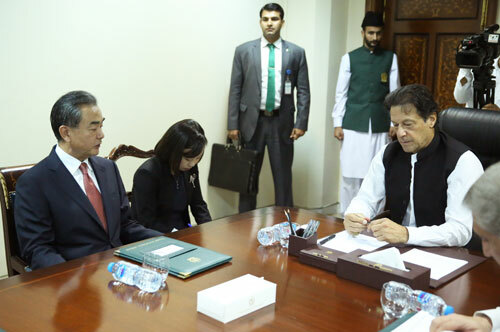 Wang Yi conveyed sound wishes of the Chinese leaders to Imran Khan. He expressed that you lead the Pakistan Movement for Justice to win the general election, which demonstrates that the Pakistani people recognize your governance concept. It is believed that the new government will unite with the Pakistani people to achieve the goal of building a new Pakistan. Wang Yi noted that after the election, Mr. Prime Minister has stressed to continue to regard the relations with China as the corner stone of Pakistan's foreign policy and firmly propelled the construction of the CPEC, which is highly appreciated by the Chinese side. We stand ready to, together with the new government of Pakistan, build China-Pakistan relations as a model for good neighborly and friendly relations, a pillar for regional peace and stability, and an example for the joint construction of the Belt and Road Initiative. We are also willing to share China's successful experience in poverty reduction, anti-corruption as well as reform and opening up with the new government of Pakistan. Wang Yi pointed out that the construction of the CPEC has produced sound driving effect for economic and social development of Pakistan, and will enter a new stage of full expansion in the next stage. We stand ready to reinforce industrial cooperation, increase job opportunities in Pakistan, and commit to improving people's livelihood according to the needs of Pakistan's economic and social development and its people, in a bid to benefit more Pakistani people.